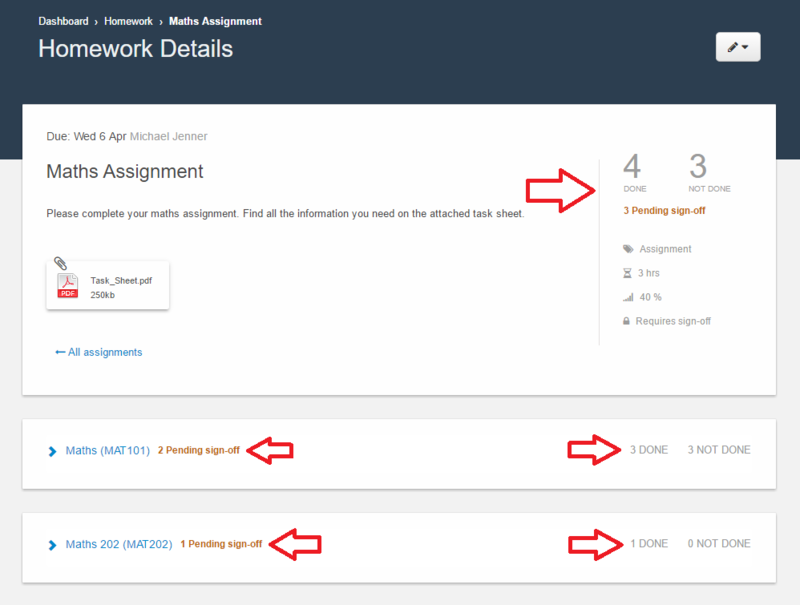 Clicking on a homework task from within the Homework or Class List areas will allow you to view the details of the task you have set, and view and update student progress and sign off status. The options available in this area will be different depending on if the task has been created with the 'Requires teacher sign-off' option selected. A student's progress on a task is classified into three different categories. Not Done: The student has not yet completed the task. Pending sign-off: The student has marked the task as complete (100% progress) in their eDiary, but this has not been signed off by a teacher. This value is set automatically and is only available if the task has been created with the 'Requires teacher sign-off' option selected. Done: The student has completed the task and it has been signed off by a teacher. If the task has not been created with the 'Requires teacher sign-off' option selected, the student will be counted as done if they are marked as complete (100% progress). To make changes to a task (such as updating details, changing the due date, or updating the students it is assigned to) click on the option menu then click Edit. 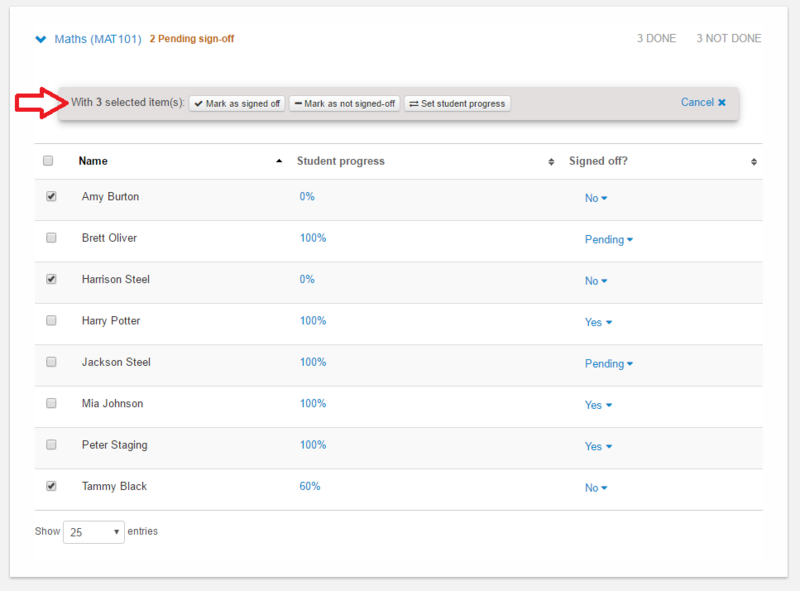 Student progress and sign-off is displayed on a whole task basis and a per class basis. 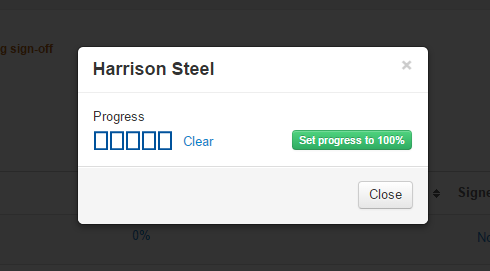 Clicking on a class opens it so that you can view and update the progress of each student within the class. Students are able to manage their own progress on tasks from their eDiary view. If for any reason you need to update a student's progress, simply click on the value in the 'Student progress' column then click the required value. Setting the progress to less than 100% will cancel the sign-off for a student that has already been signed off. If the task has been created with the 'Requires teacher sign-off' option selected you are able to sign off that the student has completed the task. Click the value in the 'Signed off?' column then click 'Yes' to sign off. This will also update the student's progress to 100% automatically. To cancel a sign off click the value in the 'Signed off?' column then click 'Cancel sign-off'. The student's progress percentage will not be changed. To save time, updating progress and sign-off status can also be done in bulk. 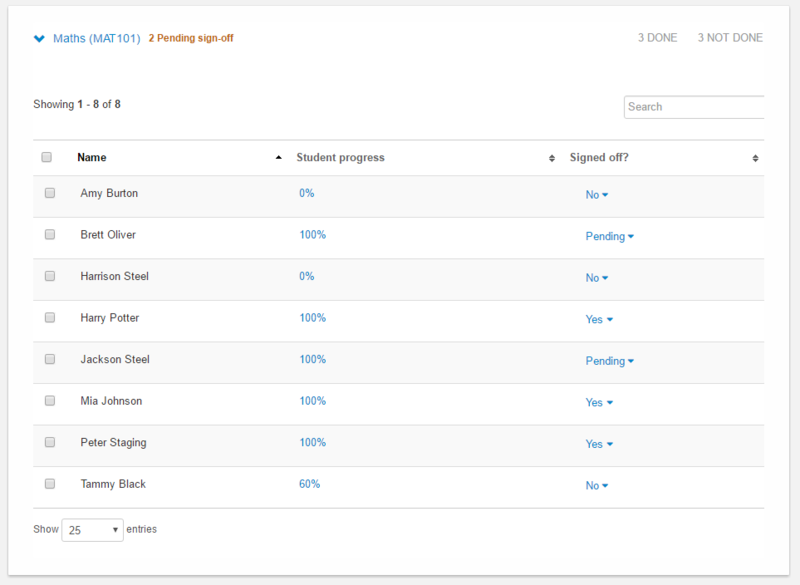 You can find the bulk actions to update the progress and sign-off status for all students the task is assigned to in the option menu at the top right. Bulk actions can also be applied on a per class basis. To access these, click on the class so that you can see the students. Then use the check boxes to select all or some of the students. The available bulk actions are displayed at the top of the table.